You will want to begin by deciding which areas of the pond you want to brighten. 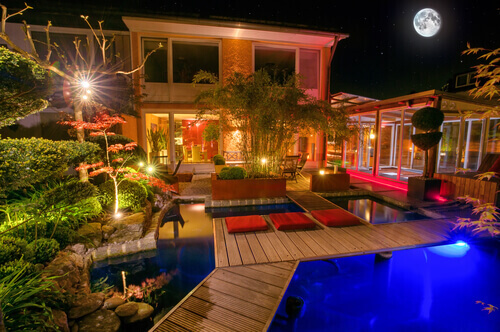 You may decide to add some LEDs near a seating area, or in specific spots which will enhance your pond by creating shadow and illumination in interesting spots. The locations you choose will determine how many lights you will need. Once you know how many lights you want, it will now be necessary to select a transformer. This transformer must be big enough to give power to all the lights. To determine this you would need to perform some very rudimentary arithmetic. You would add the wattage for all the lights you’ve selected (the majority of LEDs are only 1 watt but can be as much as 6 watts depending on the size). Once you’ve added the watts of every light you would have the total wattage. Then all you have to do is purchase a transformer than can accommodate it. It is also wise to select a transformer that can handle ten percent more than the total watts of the lights you’ve selected, to deal with possible wattage fluctuations. Many LEDs come with power cords that are 15’, which is sufficient for most purposes. However, those that want to operate lights with cables longer than 15’ can buy LED extension cables which are as long as 25’ and can seamlessly connect the light with a transformer. The majority of transformers are sold with a single outlet, which is not an issue if you only want one LED. However, those that want to use multiple lights will need to purchase a splitter. Six and three way splitters can run systems with more than one light, and accessories such as photocells are sought after because they can turn the lights on/off atomically when needed, which saves on electricity costs. Trees and other objects near the pond can be highlighted by putting an LED near the base and shining it upward. This effect works wonderfully near fountains, sculptures or statues. Wall washing is another technique that can be used to highlight the front of a building or wall, and the waterfalls within a pond can be enhanced by placing an LED in front or just below the water’s to create very stunning effects. LEDs can also be put at the bottom of the pond shining upward to create a glowing effect which is luminous and very pleasing to the eye.